I love to shop for the kids. I'll shop for them anywhere - whether I'm browsing through racks at a high-end department store or digging through tubs at a garage sale - if I'm shopping for the kids, I'm in my element. One of my favorite shopping activities includes taking myself to the GAP - filling my arms with as much as I can carry, sitting in a corner - huddled in the back of the store - and sorting through my finds as I decide what to purchase. This is obviously done sans kids as this process can be quite time consuming - and heavenly. Call me a junky, but babyGAP is like a shot of the good stuff in my veins. But like I said, I'm not all that picky - I'll take a cheap hit from a garage sale whenever I can find it....and that is where I recently picked up a new T-Shirt for Hadley. Hadley is a messy girl. I'm pretty sure that if I didn't insist, she would still eat all foods - including her favorites (mac & cheese and yogurt) with her hands. There aren't a whole lot of hand-me-downs for Cameron because Hadley manages to stain nearly everything she wears. I like to get T-shirts at garage sales so she can bask in all her messy glory without me having a stroke. My latest yard sale find for Hadley was a green T-Shirt that said Mountain Dew across the front. I paid fifty cents for it, and I thought she'd love it because her favorite color is green. Now, while I don't relish the idea of using my daughter to promote a sugary, calorie-latent, teeth-rotting soft drink, I do relish the idea of her having an inexpensive play shirt that she'll like wearing because it is her favorite color. I showed her my yard sale find to which she exclaimed, "Mountain Dew? I'm never wearing that!" "Why?" I asked. "It's your favorite color." "Mountain Dew?" she relied. "Like Mountain Doo-Doo? You want me to wear a shirt that says Mountain Poop?" "Hadley," I said in an exasperated tone. "Dew is like the wet stuff on the grass in the morning. This is like dew on a mountain. Its nature - its kind of a pretty thought." "Mom," she said. "Its Mountain Doo-Doo like Poop." I gave up. If she didn't want to wear the fifty cent T-shirt, I certainly wasn't going to fight that battle. A few days later, however, we were going to the park and then to Rural King (a farming superstore) to look at the baby chickens, and I handed her her Mountain Doo-Doo T-Shirt to wear. She put it on but told me that it was an ugly shirt and that she never wanted to wear it again. Fine. Fine. And off we went to Rural King. 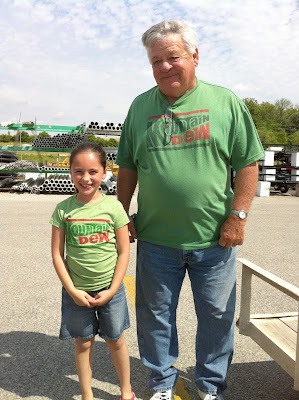 Yes, my red-neck daughter was wearing a Mountain Dew T-Shirt at the Rural King. However, as we were leaving it became apparent that she fit right in. We walked across the parking lot only to find an older man with a big belly wearing the EXACT same Mountain Doo-Doo T-Shirt. Hadley's face grew red and her eyes blazed at me. "YOU HAVE DRESSED LIKE THAT OLD GUY!!!!!!!" she screamed quite loud enough for him to hear. "Okay, okay," I whispered to her. "You never have to wear it again. Just be quiet." The poor man in his Mountain Doo-Doo T-Shirt made his way over to us, and I wanted to make a run for it to the mini-van, but I stood politely and smiled. He said to Hadley, "Mountain Dew - huh? That's some good stuff." To which Hadley replied, "Its disgusting. Like poop." I politely smiled at the man and then took their picture together. Hadley and her Mountain-Doo Doo Twin. For taking this picture - I owe Hadley one goldfish.